Gran Luchito is the Authentic Taste of Mexico. 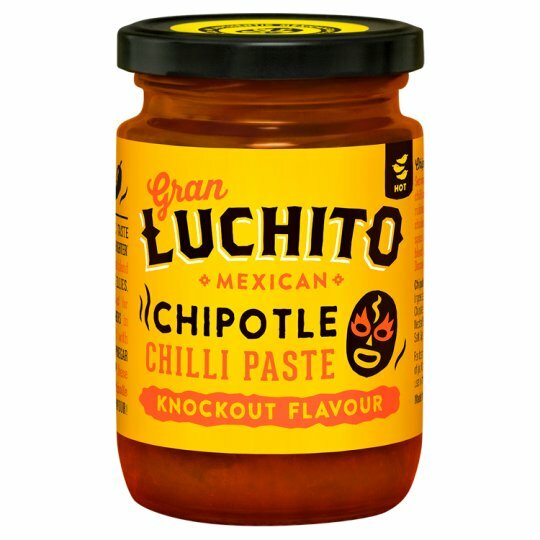 Meaning 'Great Little Fighter' Gran Luchito is made from a secret blend of Chipotle & Rare Mexican Chillies, lovingly grown and smoked for Generation by Local Farmers in Southern Mexico. Ground with Caramelized onions, Balsamic Vinegar and a dash of Dark Agave Syrup, these Chillies give Gran Luchito Chipotle Chilli Paste its Knockout Flavour! Once opened keep refrigerated and use within 6 weeks., For best before date see side of lid or base of jar. Serving Suggestions: Stirred into chilli con carne, spread onto fajitas, rubbed into steak, marinade some chicken, slow 'n' low with pork pibil, spice up huevos rancheros or simply blend with sour cream.